On August 21, 1942 at 1:15 departed Kataoka Bay off Shumushu Island. On August 25, 1942 arrived at Kiska Island from when unloading was completed according to schedule on September 15 at noon. She prepared to depart on the following evening. On September 16, 1942 attacked by American aircraft. Near misses holed the ship and flooded the engine room causing the Nozama to lose power. One minute later the ship was directly hit amidships by a dud bomb. At 4:42 the ship was machine-gunned and the captain killed. Emergency repairs and pumping began but at 4:54 another air attack caused a larger hole. 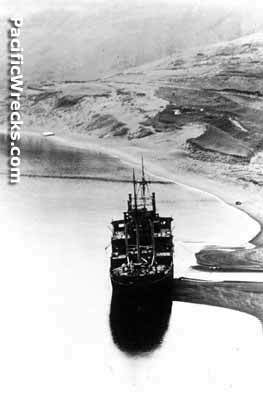 To save the ship from sinking, it was run aground at Trout Lagoon near the mouth of a small stream. 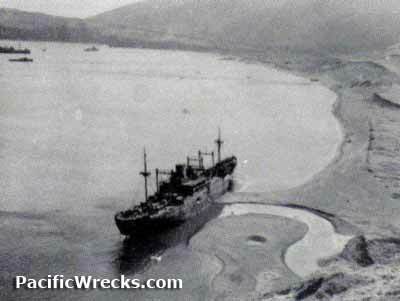 Damaged beyond repair, the ship was abandoned by the Japanese on October 13, 1942. On October 16, bombed by American aircraft, but the bombs dropped are repored as duds. The next day, B-24s again bomb the ship, but the results were not observed due to clouds. Later on April 20, 1943 it was bombed again. The shipwreck remained exposed along the shoreline in situ until 1956. 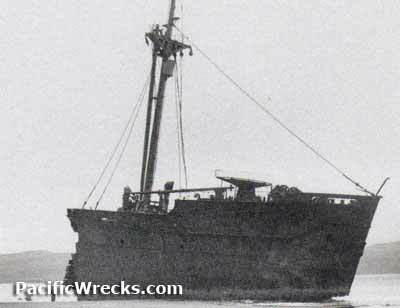 The stern section was refloated in 1956 by the the American tugboat Salvage King. Towed by Salvage King and Canadian tugboat Sudbury II bound for Japan to be sold as scrap, but sank en route due to a storm. The bow section remains in situ almost straddling a small creek in Trout Lagoon.